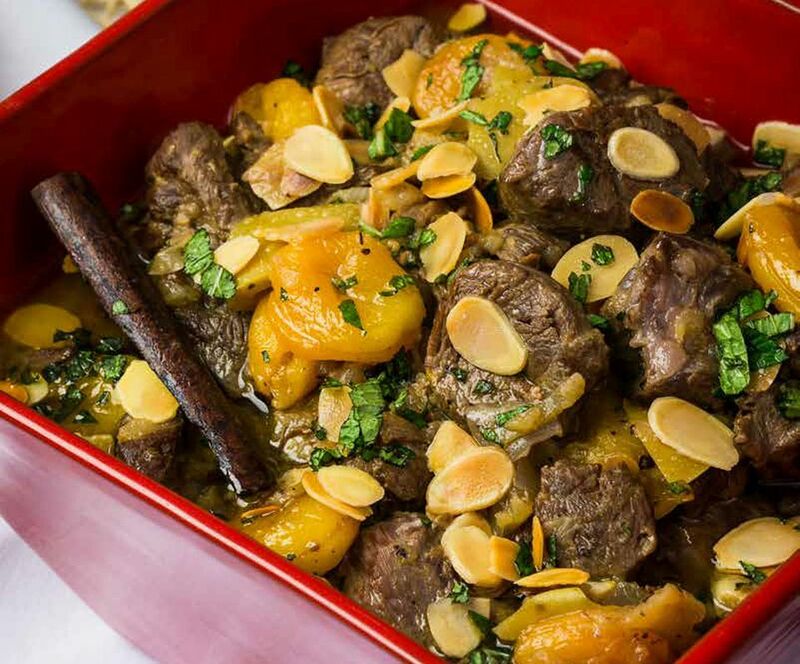 This recipe for Kosher Lamb Stew with Apricots, Pear and Mint is from Paula Shoyer's "The New Passover Menu" (Sterling Epicure, 2015). Shoyer features recipes with a global theme (read more about it, below, after the directions to this recipe), like this Moroccan-inspired one which can be made two days in advance. "Moti Yitzhaky was an auto mechanic before he opened Moti’s Market and Grill in Rockville, Md., which now provides our community with a full-service kosher butcher, baker, and grocery store, all in one. "He applies the same precision from his former career to recipe development and has created flavorful food inspired by his Moroccan ancestry and beyond. "Moti gave me a recipe that was the inspiration for this one, a hearty stew brightened up for spring with fresh pear and mint," Shoyer says. In a large wide saucepan or Dutch oven, heat 1 tablespoon of the oil over medium-high heat. Add the lamb pieces in batches and cook, using tongs to turn the pieces, until well browned on all sides. Do not crowd the pan. Remove the browned pieces to a large bowl. Add the onions and garlic to the saucepan plus the other tablespoon of oil and cook, scraping the bottom of the saucepan to avoid sticking, for 5 minutes, until the onions are browned. If the onions start to burn, turn the heat down to medium. Add the lemon zest, orange juice, cinnamon stick, honey, and broth to the saucepan, and bring to a boil. Season with salt and pepper to taste. Return the lamb pieces to the saucepan, cover, and cook on low heat for 1 1/2 hours. On the Stovetop: Heat a frying pan over medium heat, add the nuts and stir often until golden brown on all sides. Do not walk away because the nuts may burn the second you do. In the Oven: Heat the oven to 325 F (160 C). Place the nuts on a cookie sheet and bake for 15 to 20 minutes, shaking the pan or stirring once, until golden brown and fragrant. More About Paula Shoyer's "The New Passover Menu"
Paula Shoyer is a Kosher food expert who has written "The Kosher Baker: Over 160 Dairy-Free Recipes from Traditional to Trendy," "The Holiday Kosher Baker: Traditional and Contemporary Holiday Desserts," among others and has shared many of her recipes with my readers. To learn more about her, visit www.thekosherbaker.com. In her latest book, "The New Passover Menu," Shoyer takes a fresh look at traditional Passover recipes by combining family favorites with contemporary, globally inspired creations. She organizes the 65 recipes by menus to simplify holiday cooking (which covers the two Seders, Shabbat and Yom Tov as well as four menus for the weekdays of the eight-day holiday) and gives equipment lists, tips for advance prep and table settings. It's a visually stunning book.